The cargo bike short has a fun and nimble ride. 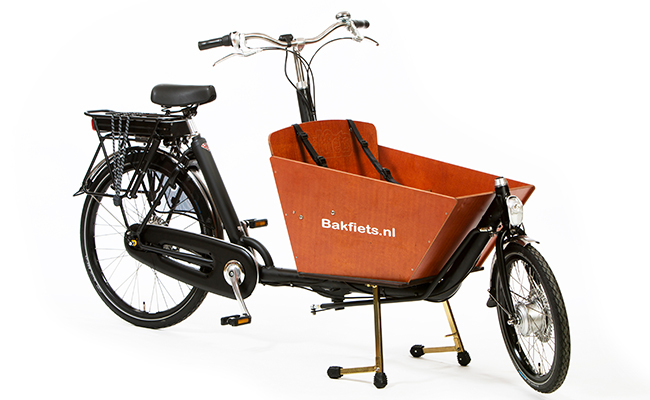 Welcome to the cargo bike short by the now legendary Bakfiets.nl – the inventor of the two wheeled cargo bike for kids. Awarded again last year as the best cargo bike for kids. Although the cargo bike long is our most popular version, the cargo bike short has a fun and nimble ride with enough room for two kids in the box, a medium sized dog or lots of groceries. Plus with the ultra strong rear carrier you can easily carry another 40-60 liters of cargo or even another child. Find out why Kendra LOVES the Cargo bike Short! Made in Holland, Ultra strong steel frame with oversized tubing,Tough three layer anti­rust powder coat, marine grade plywood box, ultra strong rims with stainless steel spokes, Marathon anti­puncture tires, shimano nexus internal hub, Powerful Shimano IM81 hand operated front and rear roller brakes, ultra strong rear carrier (50kg capacity) with elastic straps, fenders, fully enclosed chain, hub dynamo powered front & rear lights, rock solid & patented four point stand, bell, two three point child harnesses. 3 speed, 7 speed, 8 speed, NuVinci 360, Pedal assist,car seat adapters (<1yr), toddler support seats, rain/cold canopies, box covers, all­ over covers, cupboard under bench, seat cushions.